Detroit's Da'Shawn Hand celebrates after recovering a fumble during the second quarter. 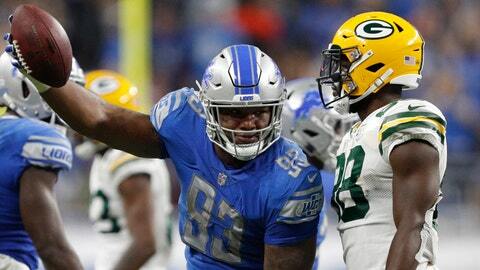 “It was big to chew up some time to give our defense a little bit of a rest and come away with some points,” Stafford said. Rodgers was 32 of 52 for 442 yards — the second-highest total of his career — with three TD passes. The Lions, who didn’t face Rodgers last year, have won three straight in the series for the first time the 1990-91 seasons. Detroit had success on defense, going after Rodgers with just four players and dropping seven into coverage. Rodgers held onto the ball to wait for receivers to get open, but they couldn’t, and it led to three sacks and his two fumbles.